Written for the Coursera (MOOC) Class – ‘Turn Down the Heat, Why a 4oC Warmer World Must be Avoided‘ by the World Bank Group (May 2015). 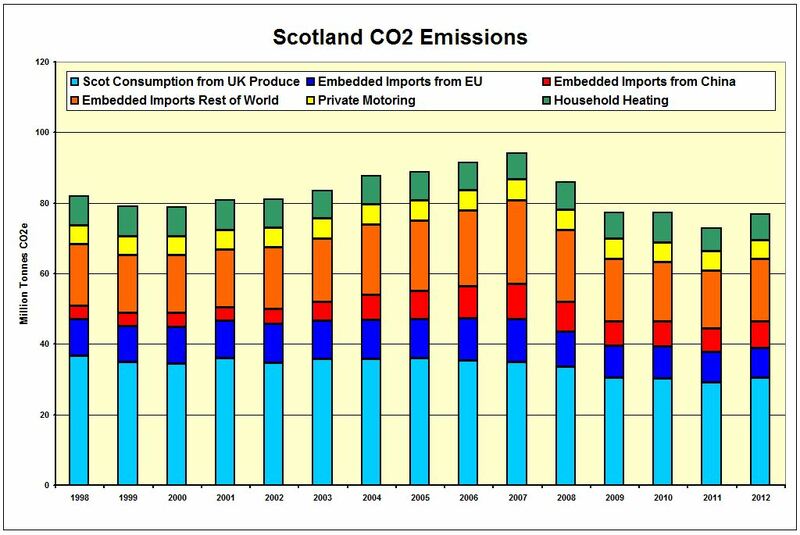 As part of the European Union, Scotland (UK Devolved Government) has agreed to a set of ambitious targets to reduce Greenhouse Gas emissions in line with UNFCCC Kyoto Protocol and extended targets. 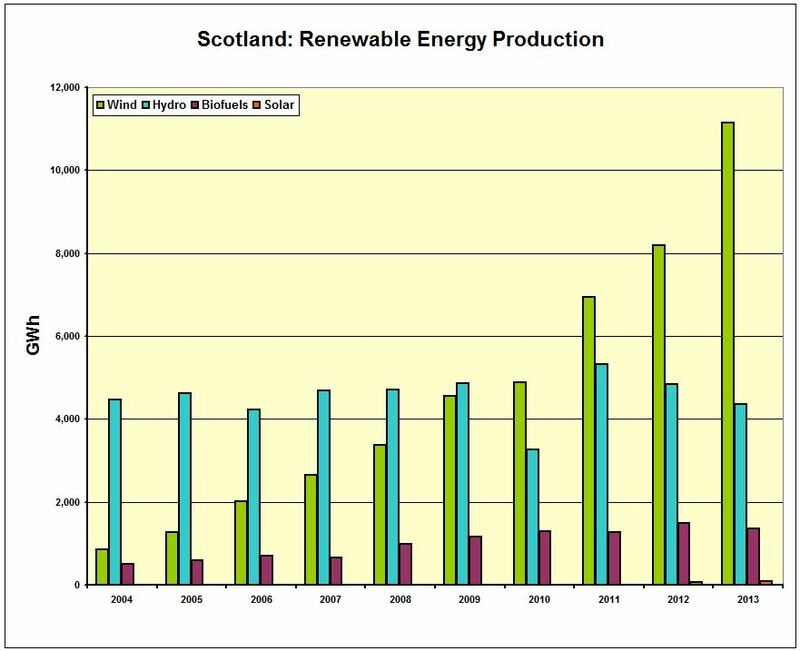 Scotland has significantly increased Renewable Energy capacity in the past decade, mainly through Wind Energy expansion. 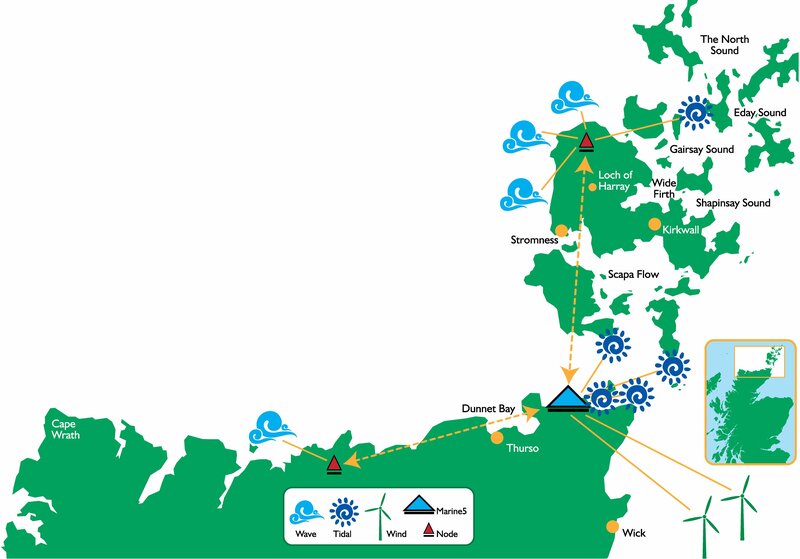 Marine Energy (Tidal Stream and Wave) projects are being developed at the European Marine Energy Centre on the Orkney Islands, adjacent to the Pentland Firth. Substituting energy supply at fixed locations such as homes and factories away from fossil fuel sources is progressing well. 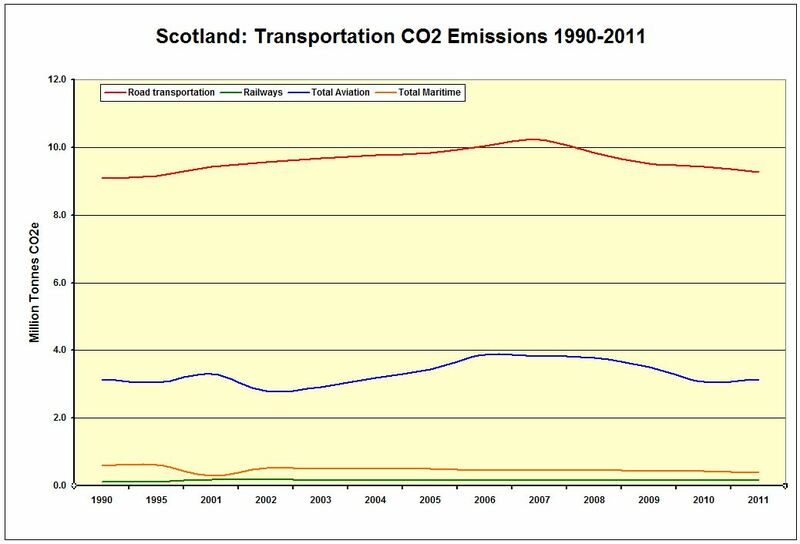 However, the problem of displacing transport fossil fuel consumption is more challenging. Liquid fuels such as petrol (gasoline) and diesel are well suited to powering vehicles, since they are a highly concentrated and portable form of energy. We are heavily reliant on petroleum fuels for personal and public transportation as well as for freight. 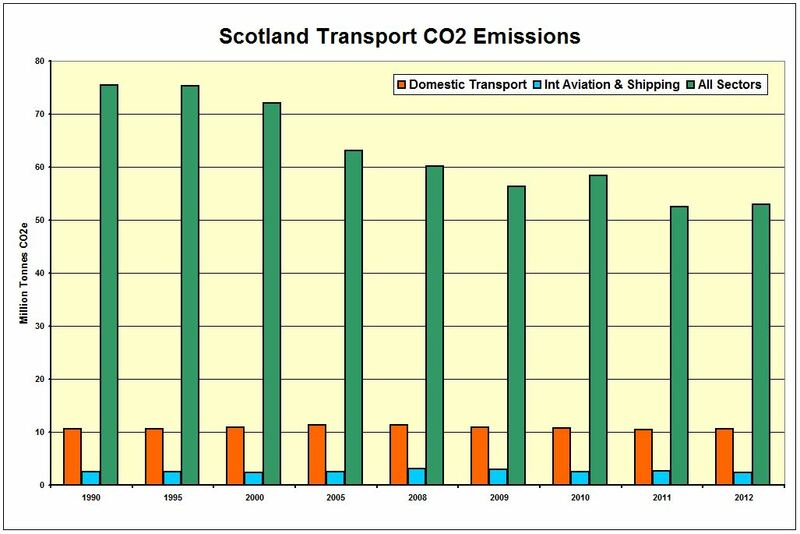 Transforming the transport system away from fossil fuel reliance is the most difficult element in Scotland’s transition to a sustainable low-carbon society. 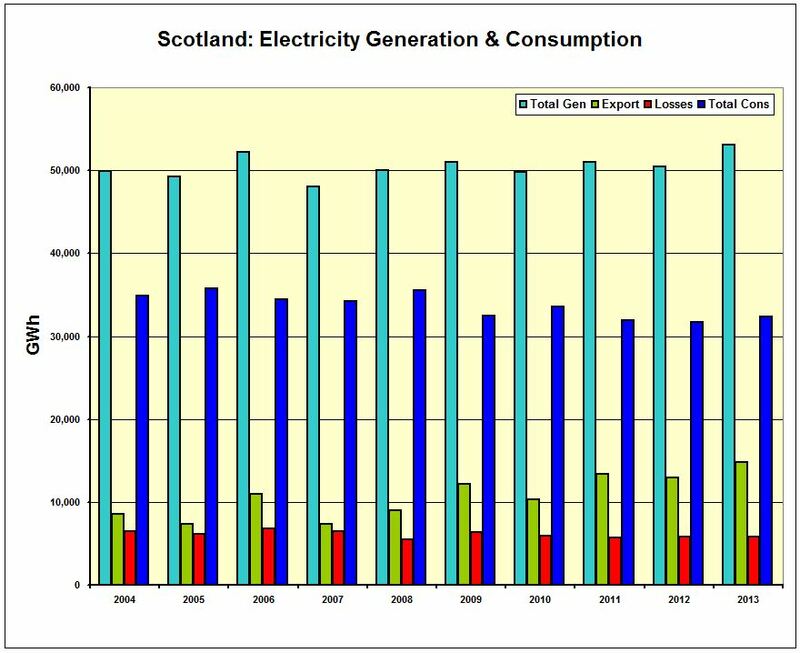 Scotland’s energy consumption has reduced over the past decade, due to energy efficiency measures and the global economic downturn. This expansion is still progressing with 7.2 GW installed and a further 12.6 GW in planning or construction. [2.4] Over the next few years, renewable energy could account for 90% of electricity consumption. 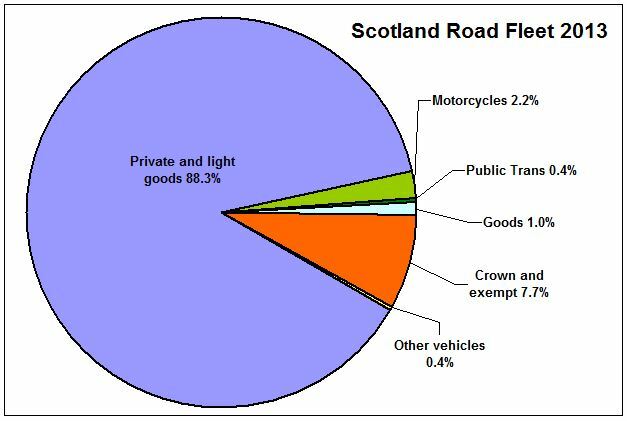 The vast majority of road vehicles in Scotland are cars and small vans (private and light goods). 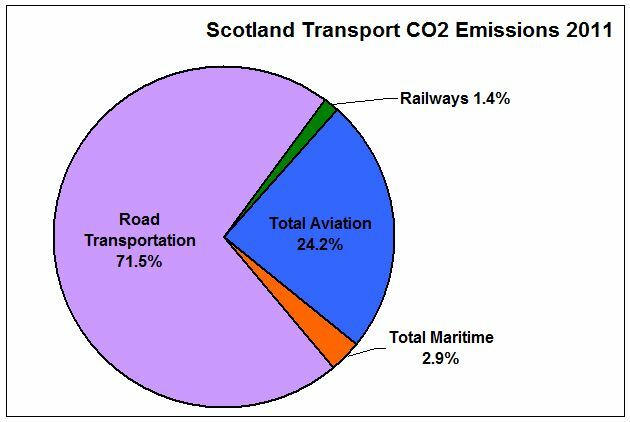 The Scottish government transport department is investing time consulting with the community and transportation stakeholders to find a solution in decarbonising the transport network. 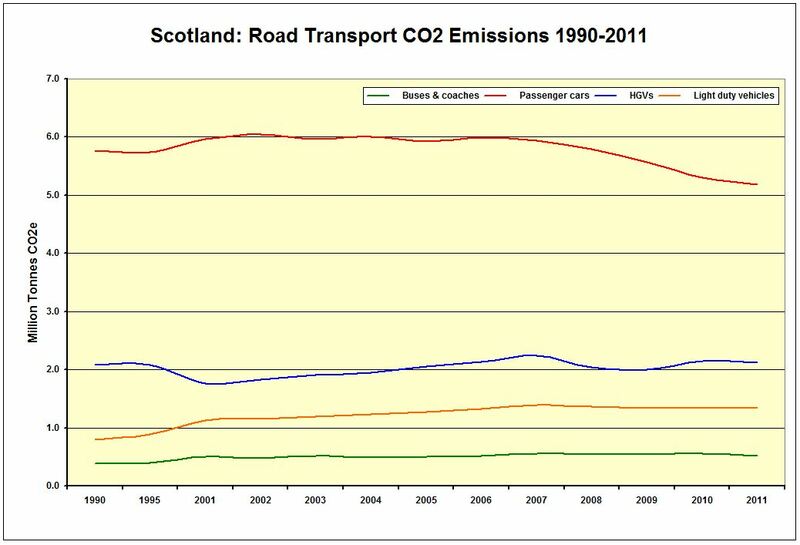 The biggest transportation source of CO2 emissions is the petroleum fuelled road network. As EV sales develop and the technology matures, prices should fall to the level of conventional vehicles. 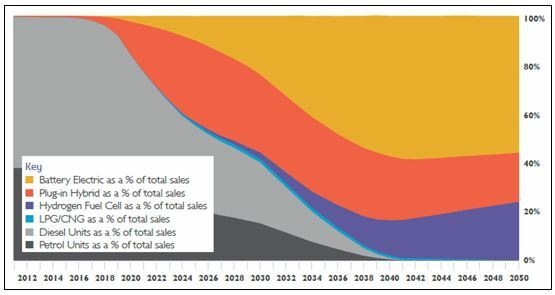 Similarly, recharge point infrastructure is expected to grow with vehicle sales. Government support is helping roll out facilities to support early adopters. Switching cars from petroleum to electric power will put extra demands on the electricity network. However, with expansion of renewable energy and grid storage, there should be sufficient capacity. If the petroleum road vehicle network can be replaced satisfactorily by electric vehicles on an expanded grid, I am confident that the other carbon intensive elements of our economy can be neutralised. Developments on all energy fronts over the next few decades will determine whether we can as a global community avert the worst effects of global warming and avoid dangerous levels of climate change. Let’s stay well below 4oC and keep the Heat Turned Down. 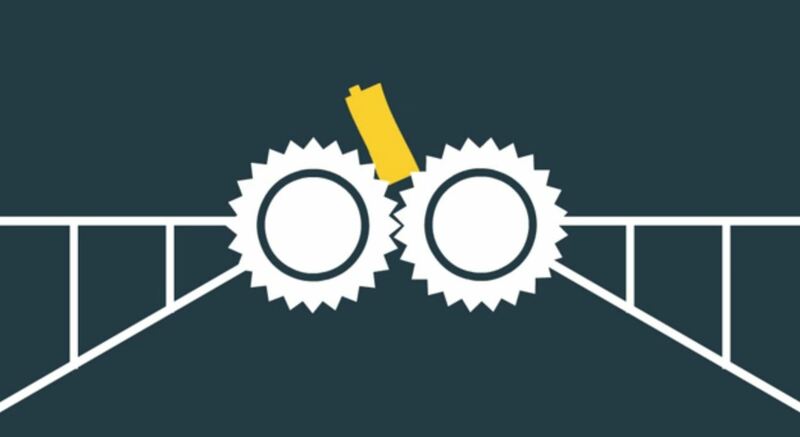 [5.4] Scientific American, When an Electric Car Dies, What Will Happen to the Battery? Ownership of the Arctic region has been disputed over the past century. Discovery of Oil and Gas resources in the Arctic and improved accessibility in recent years has heightened the stakes. It is estimated that the Arctic Region holds the largest virgin oil and gas fields in the world . Global warming and retreating ice is making the region more accessible . Five countries border the region: Russia, USA, Canada, Norway and Denmark (Greenland). Most of the Arctic lies in International waters. The US Geological Survey published estimates of Arctic Oil and Gas inventories in 2008 . 90 billion barrels of oil. 1,669 trillion cubic feet of natural gas. 44 billion barrels of natural gas liquids. 84 percent of resources in offshore areas. Ownership of the oceans and ocean floor is governed by the United Nations Convention on the Law of the Seas (UCLOS) . This international law sets out a 200 mile ‘Exclusive Economic Zone’, extending from the coastline. Within this area of sea, a nation has rights for exploiting and managing all materials (living and non-living) in the water and below the sea bed . A sub-group of UNCLOS contains the Commission on the Limits of the Continental Shelf (CLCS), which allows for a nation to extend sovereignty beyond the limits of the EEZ if the CLCS verifies that a country’s continental shelf extends further . In order that a claim to extend the EEZ can be made, a country must ratify UCLOS. As of 2014, all Arctic nations have ratified UCLOS except USA. 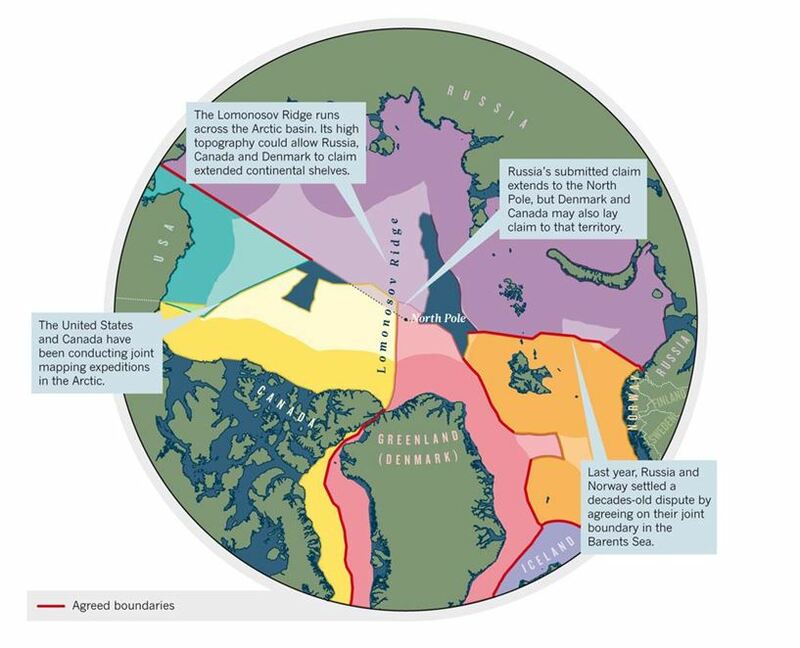 Currently, there is no clear ownership of the Arctic beyond the EEZ limits of bordering nations. The Arctic Council (established 1996) is an exclusive body which seeks to resolve issues between member states, and commissioning joint research in the Arctic environment. There is great interest in exploiting the fossil fuel mineral wealth in the Arctic, and ownership of the mineral rights would lead to lucrative deals. There are grave concerns for the Arctic environment, as oil pollution from accidents such as the Deepwater Horizon incident in the Gulf of Mexico in 2010, would be devastating to the pristine Arctic . Cleaning-up spills in the Arctic would be much more difficult, due to the icy water and remoteness from response facilities . I believe that no exploitation of Oil and Gas in the Arctic, beyond currently recognised EEZs should be allowed, until a robust framework for environmental protection and sharing of resources is agreed. The stewardship of the international waters of the Arctic should be the responsibility of the United Nations (UCLOS) with a leading role for the Arctic Council. Location: North Coast of Scotland (UK), near the town of Thurso on the Pentland Firth. Marine Tidal Energy has great potential in this location and preliminary testing is progressing with promising results . The Pentland Firth has been identified as one of the best locations for harnessing tidal energy in the world. The Firth is a narrow stretch of ocean between mainland Scotland and the Orkney Islands . The North Atlantic meets the North Sea at this point and the tidal flow through the Firth is very high. 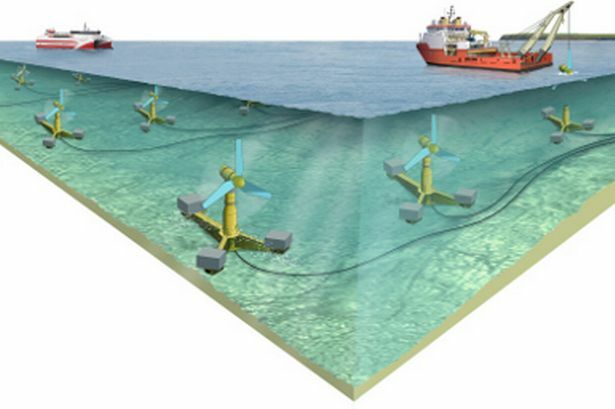 The leading Tidal Energy devices are bladed turbines, similar in appearance and operation to Wind Turbines, which are mounted on the seabed . Tidal energy is very regular and predictable, unlike wind power, and since water is much denser than air, smaller turbines can yield more energy underwater . It has the added advantage of being less of a potential nusance, since the turbines are located underwater and out of sight, and do not generate much noise. 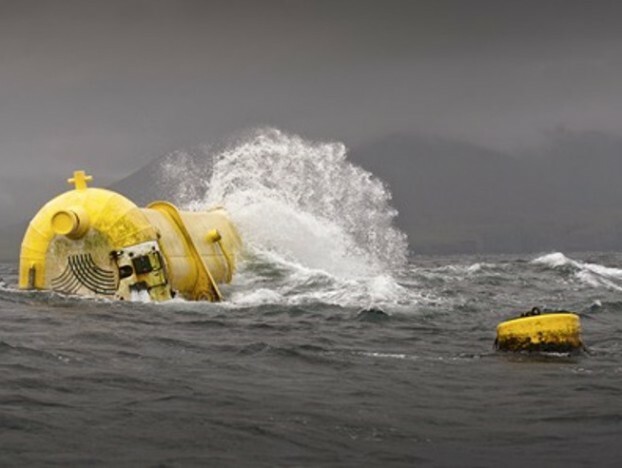 Some disadvantages of tidal energy technologies are that they need to be robust enough to cope with the harsh marine environment, and are more difficult to maintain. These aspects mean that construction and running costs are higher than land based technologies. A team of scientists from Oxford and Edinburgh Universities estimates energy output potential of between 1.9 – 4.2 GW (16 – 35 TWh annually) . The oceans are an abundant source of renewable energy, which are under utilised at present . Justification for choosing Tidal Energy in my location, is supported by the scale of this natural resource, together with the strength of international interest in developing marine tidal energy here. The European Marine Energy Centre (the only facility of its kind in the world) is located on Orkney, and as well as facilitating testing on energy devices, it plays a leading role in developing international standards for the industry . Harvesting energy locally is important for Energy Security, so that we are not reliant on imported power . Tidal Energy in the Pentland Firth is one of several measures in the suite of technologies currently being researched and deployed throughout Scotland (and the UK), including onshore and offshore Wind Turbines, Solar PV, Wave Energy devices, and Geothermal plant. 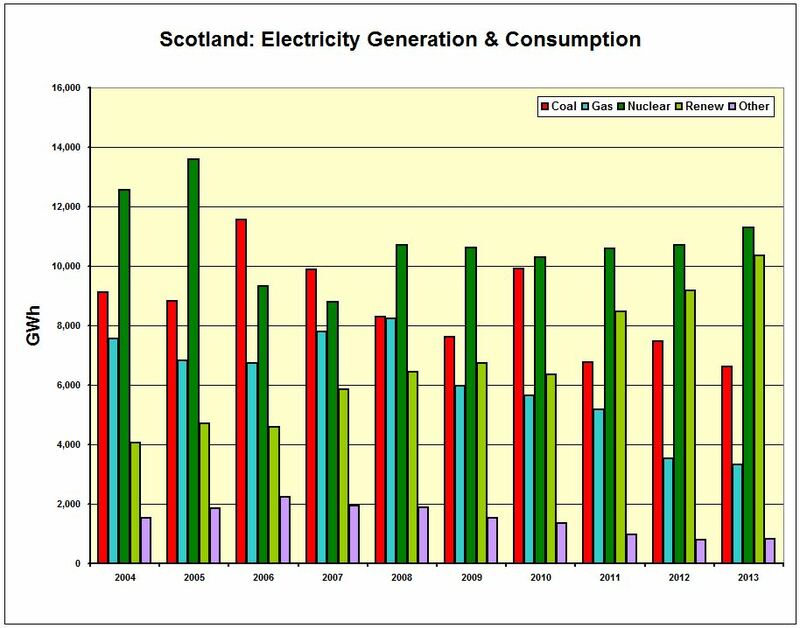 Scotland is committed to producing 100% of its electricity (consumption) from renewables by 2020 . In February of this year, the Scottish Government granted £4.8 million to marine energy projects . The Scotsman, ‘Pentland Firth tides ‘can power half of Scotland’, 20 January 2014. 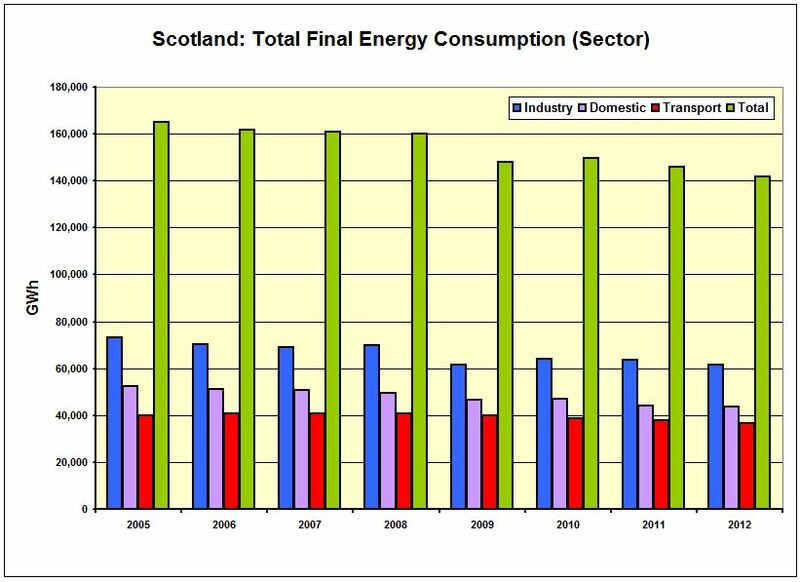 Scottish Government, ‘£4.8 million boost to marine energy sector’, 26 February 2014. Arguably, the greatest challenge facing humanity today is provision of fresh water. Water is critical for all life on earth and humans consume an average of 1,385 m3/yr . We are approaching the limit of natural fresh water availability required to match consumption . The scope of this challenge is global. According to UNESCO, more than 780 million people (10.8%) have no access to clean water, 2.5 billion (34.7%) have inadequate sanitation and around 7 million die annually from water related disease . The reason for selecting this challenge is that with rising populations  and the prospect of significantly altered weather patterns due to global warming, provision of adequate fresh water supplies to areas of dense population and agricultural land is likely to intensify over the next few decades and beyond . One way to help alleviate water scarcity is by more efficient use of available water, recycling of grey water for sanitation, agriculture/horticulture, and industry . The trend in the last century has been for increased global water consumption by a factor of ten . Agriculture is by far the largest consumer of fresh water . The driest half of the earth is occupied by 85% of the human population . An ocean-based initiative to this problem is Desalination, which converts salt water to fresh water, by a process of reverse osmosis. Salt water is pressurised (250 – 1000 psi) and passed through a series of membranes, which strips out the impurities, including salt . 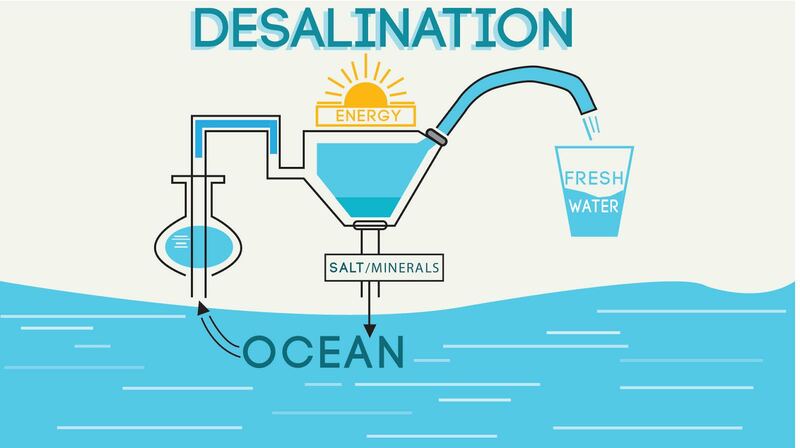 Desalination technology can be used to convert seawater, brackish water and waste water. The reason and justification for making this decision is that desalination plants are already in use across the world, having been developed in the 1950s. The technology has been particularly successful in arid regions which have the financial resources to construct plants, such as the Middle-East and the Western USA . The cost of desalination plant is reducing with time, and the quantity of installations increasing. Since the 1970s, global production doubles every decade, and costs have reduced by half every 15 years . 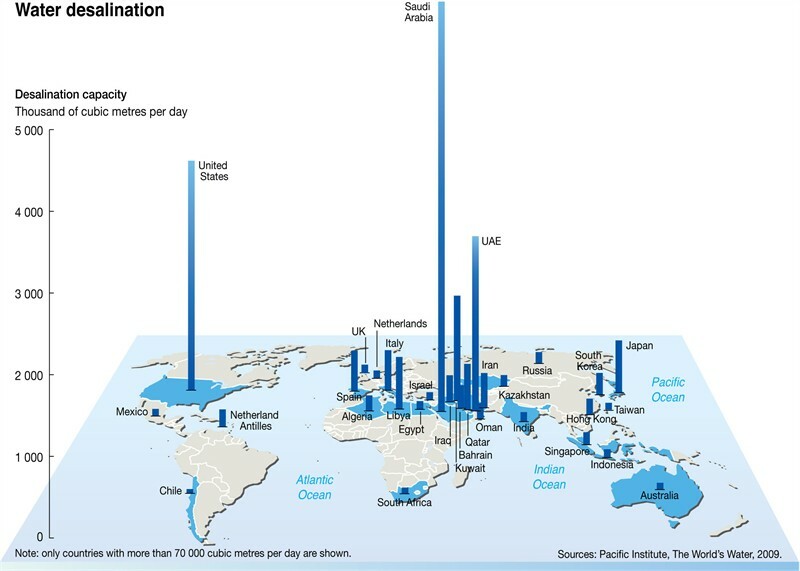 Factors that impede desalination in delivering fresh water, a key resource for humanity include: Capital Cost, Energy Consumption and Public Perception of Water Quality. As water becomes more scarce, the cost of plant will have to be met since few other options are available. The cost is falling with time and with an expansion, economies of scale may make it more affordable. Desalination is energy intensive, but since the worst drought affected areas are in the tropics, solar power can be harnessed . 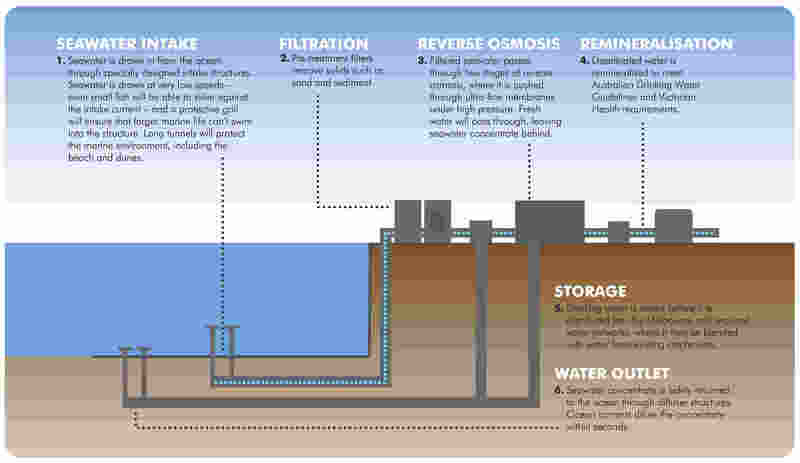 Public perception is that desalinated water does not taste as good as natural fresh water. However, ‘blind tests’ indicate that there is no real difference in water quality . Desalinated water is often a healthier option, since the process also removes harmful bacteria . Written for the Coursera (MOOC) Class ‘Energy, the Environment and Our Future’ by Pennsylvania State University (March 2014). In the UK there is concern over future electricity generation since most of the current Coal and Nuclear capacity is approaching end of design life. No new Nuclear stations have been built since 1995 (Sizewell B), and of the nine in operation (9.2 GW) eight are due to be decommissioned within the next ten years. Many of them have been extended beyond their design lives already. Indigenous supplies of North Sea oil and gas is in decline. 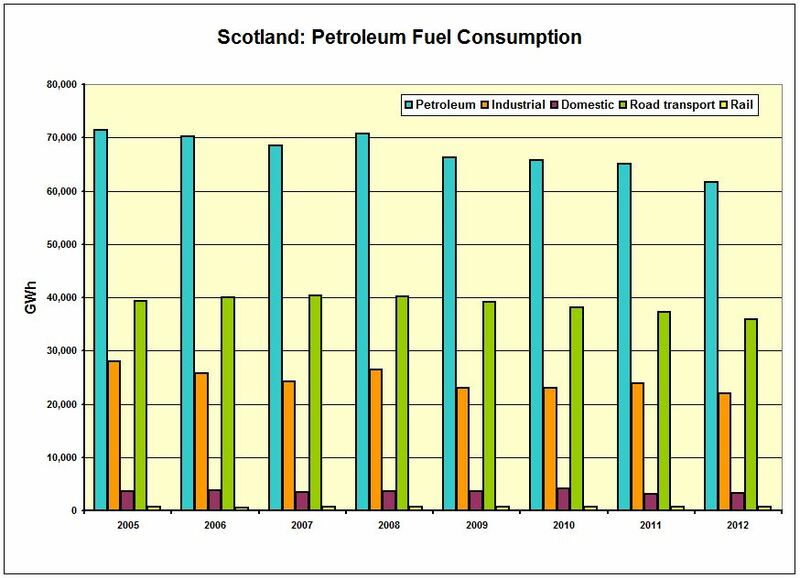 The UK imports most of its oil from Norway, and much of its gas. 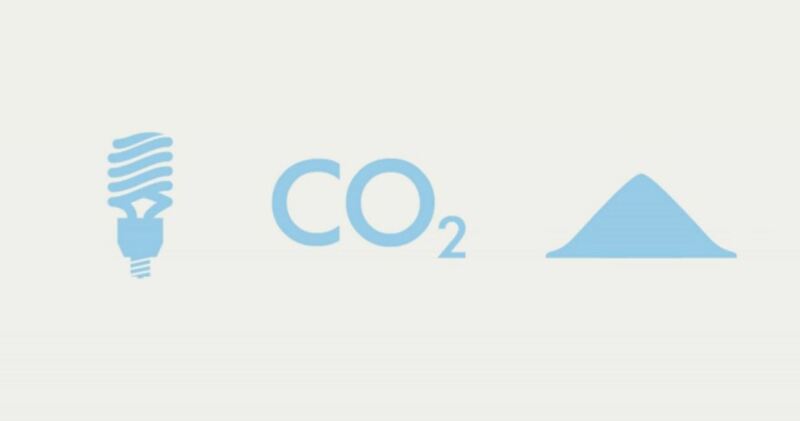 With ambitious targets set for emissions reductions of CO2, fossil fuel technology is being displaced by renewable energy sources. Energy efficiency is becoming increasingly important in ensuring energy security. 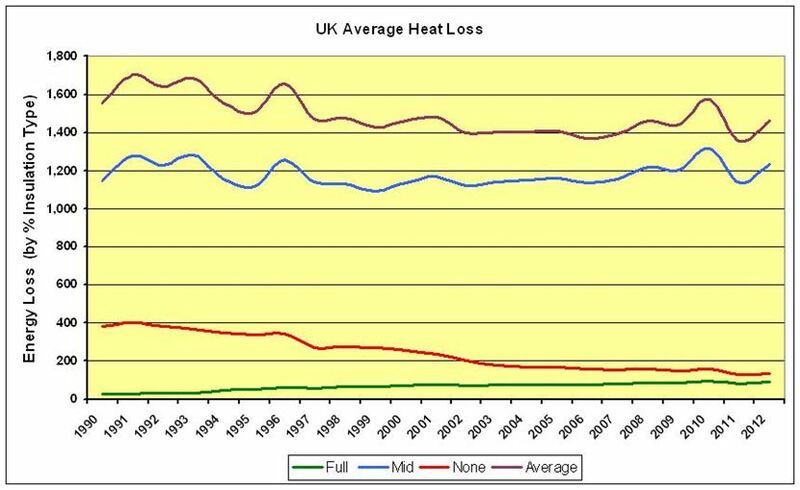 A major component of energy consumption in the UK relates to losses from poor building insulation. The UK housing stock is approximately 24.5 million homes. As a first step in energy conservation, these losses must be reduced by upgrading the thermal performance of sub-standard buildings. Many buildings in the UK are hundreds of years old, 21% built before 1919. 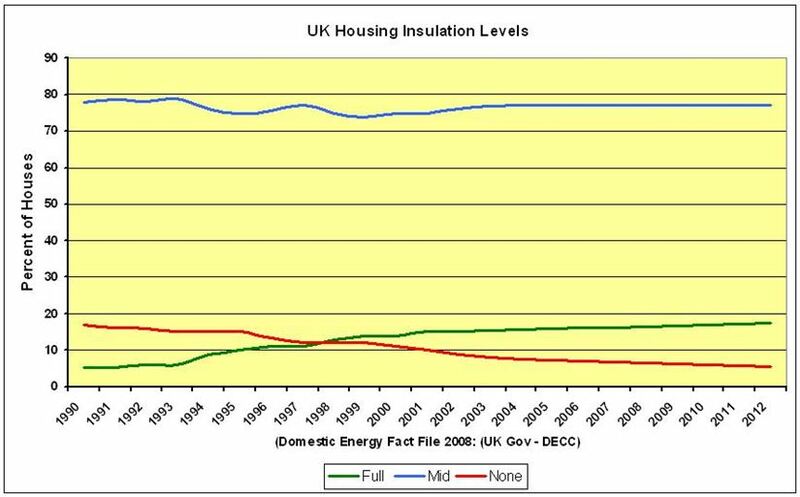 Those other than new builds over the past decade are likely to have sub-standard insulation. The Green Deal (2012) is designed to reduce the upfront costs to the consumer of energy efficiency. Repayment is made through savings on their energy bills. Around 22.2 million dwellings in England (26.3 in UK). 15 million dwellings were owner occupied and 3.3 million were privately rented. Remaining 3.9 million were fairly evenly divided between local authorities and housing associations. One in five (21%) dwellings were built before 1919. Three quarters of these older dwellings have been subject to at least some major alterations since they were built and 43% have had extensions or loft conversions added. Dwellings built after 1990 accounted for just 12% of the stock. The majority (81%) of dwellings were houses or bungalows; most of these being two storey houses. Flats made up 19% of the stock. The average useable floor area of dwellings in England was 91m2. One in ten dwellings have attics (either as built and loft conversions). 95% of dwellings were of traditional masonry or timber construction; the majority of these were cavity brick/block. This type of wall construction is the most difficult and expensive to insulate. Whereas most cavity walled (double skin) buildings can be injected with insulation foam, solid wall have to be clad, either internally or externally. There are several incentive schemes on offer to property owners for insulation upgrade work, but the rate of improvement on the whole has been slow. The UK Government Department of Energy and Climate Change realise that the two schemes on offer are not attracting enough participants. The ECO scheme is attributed as incentivising a large portion of the 457,000 properties insulated in recent years, still a small percentage of the tens of millions of homes with sub-standard insulation. That scheme was implemented both to help insulate the homes of people in fuel poverty and difficult to insulate buildings, those older properties with solid walls. The logistics and expense of having assessment reports carried out, and the unattractive 8% interest on finance are putting many people off. The disruption of having modification work in your home is another disincentive. 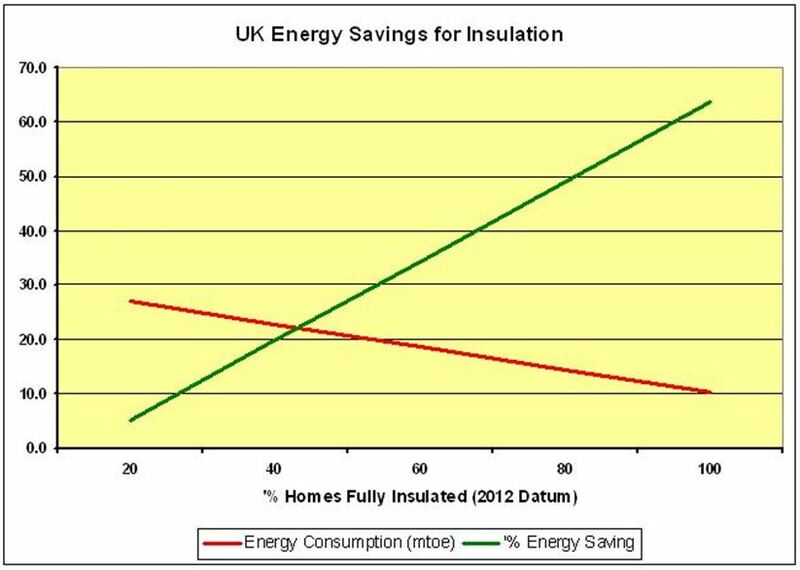 However, with energy prices rising, improved insulation is an obvious way to future proof against this. Overall energy efficiency will help the country in reducing total energy consumption. The level of insulation varies with the age of buildings and the building standards at the time of construction. It has only been since the energy crises of the 1970s that standards have improved. Again the building standards were raised in the past decade in light of concerns over CO2 emissions and rising energy costs. Translating insulation quality into energy losses, the largest gains are by insulating very old buildings which have little or no insulation. It is these buildings which are more likely to be solid wall. The vast majority of buildings have some level of insulation, but would benefit from upgrading. 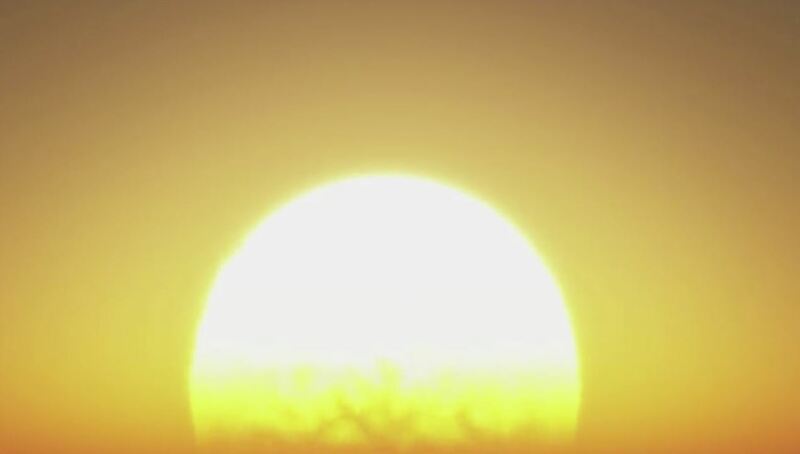 The spikes in heat loss 1991, 1993, 1996, 2010 and 2012, relate to low annual average temperatures. More energy is required to maintain rooms at a comfortable temperature. Leaky buildings lose heat at a greater rate. 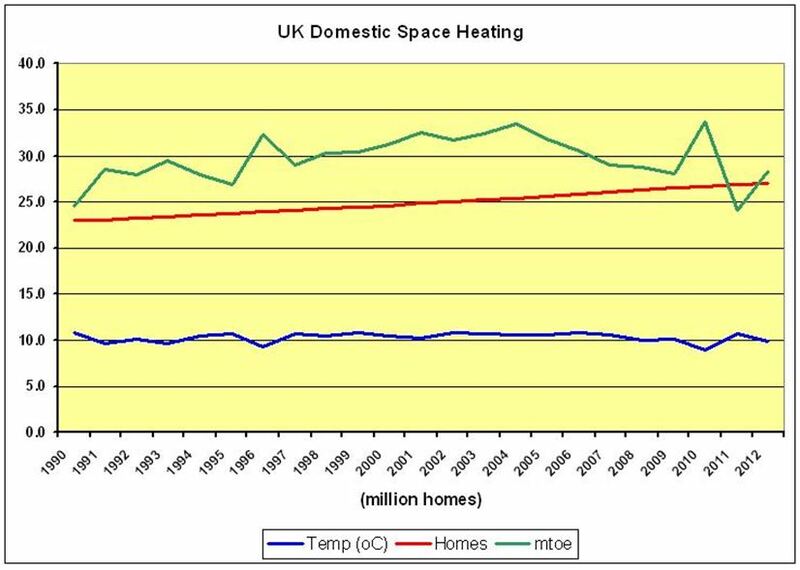 The overall trend in space heating energy consumption is linked to the number of households, the average temperature and the quality of building insulation. For the purposes of this analysis, I chose three levels of insulation, high, medium & low. These relate to the building standards of the time. The largest band of medium insulation level is a broad average which best fits the energy consumption data. 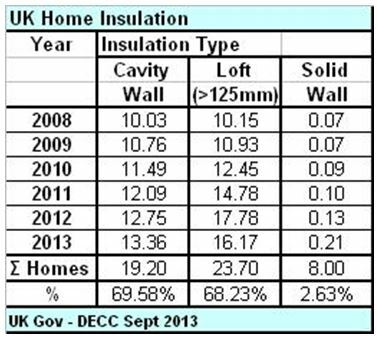 In 2012 it is estimated that 17.5% of the housing stock is well insulated. This leaves a lot of room for improvement. As can be seen, from the linear relationship between percent of homes well insulated to national energy savings, significant energy savings can be achieved. National Insulation Association, ‘Did You Know – Facts’, March 2014. ‘How can I insulate my house if I don’t have cavity walls?‘, The Telegraph, 14 January 2014. National Insulation Association (UK) 7 Mar 2014. Written for Coursera (MOOC) Class ‘Climate Change‘ by the University of Melbourne (Sept 2013). In a World Bank Report, ‘Convenient Solutions to an Inconvenient Truth’, published in 2009, it lists the countries with the highest risk of Climate Change threats. Looking at Sea Level and the threat to the countries listed, I want to have a closer look at the situation for those with most to lose, who have least political or economic influence. The Alliance of Small island States includes the low-lying countries of interest. Established in 1990 to provide a consolidated front in voicing the very real and immediate threats posed by global warming. It was the first body to submit a draft text in the Kyoto negotiations in 1994. 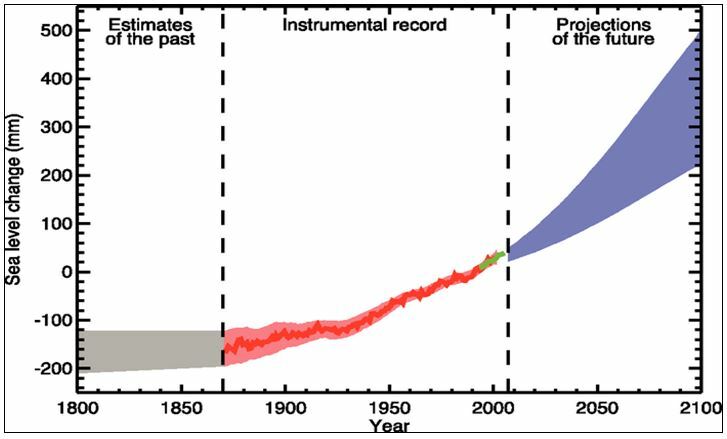 The 2007 Fourth Assessment Report (AR4) projected century-end sea levels using the Special Report on Emissions Scenarios, see the graph below. Average sea levels are predicted to rise between 0.21 and 0.45 metres by 2100. Also note that subsequent independent studies have found the IPCC estimates to be conservative. Rises in sea level has implications for coastal habitats and economies, specifically in relation to freshwater contamination and loss of land (including supported infrastructure). Gaining independence from the UK in 1979, it remains part of the Commonwealth and is a parliamentary republic. It comprises of 32 atolls and one coral island. It has strong relations with Australia, Japan and New Zealand. Approximately 90% of the population live on the Gilbert Islands, with 33% occupying an area of just 16 km2. It is one of the most impoverished nations on earth, with little hope of retaining its territory. It already suffers from overcrowding, with 4,700 inhabitants resettled in 1988, and in 2008 the Kiribati government approached Australia and New Zealand to accept Kiribati citizens as refugees, in preparation for sea inundation. 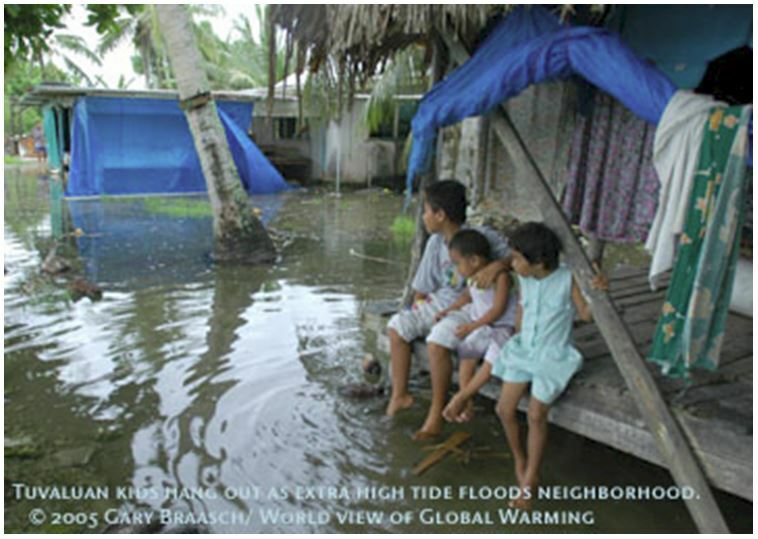 Rising sea level is expected to continue in Kiribati, as with elsewhere. 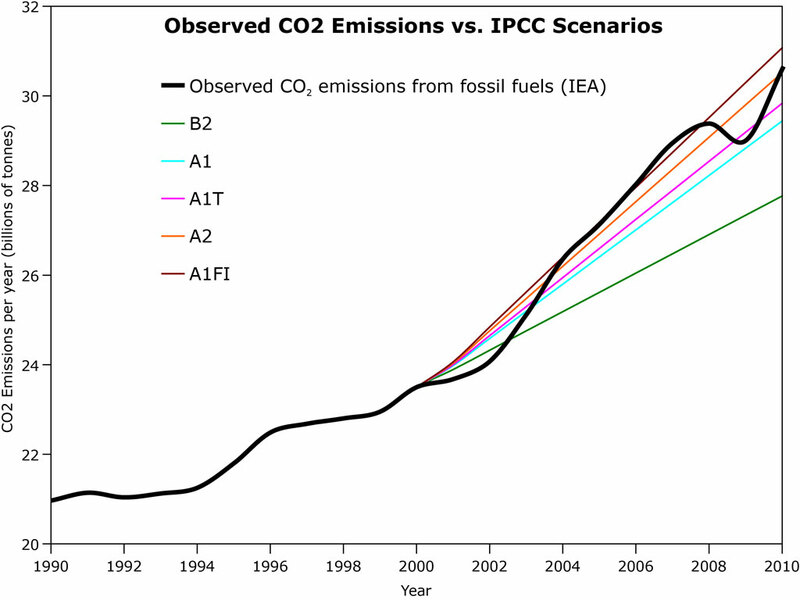 By conservative estimates, shown in the table below, by 2030 (under a probable high emission scenario) this rise is projected to be in the range of 5 – 14 cm. Sea-level rise combined with natural annual changes will increase the impact of storm surges and coastal flooding. A 50-centimetre rise, which is now considered a conservative projection for this century unless emissions are curbed, threatens the very existence of this small nation. Freshwater sources are becoming more contaminated by sea water. The majority Kiribati’s islands are so narrow that there really is no place to go. 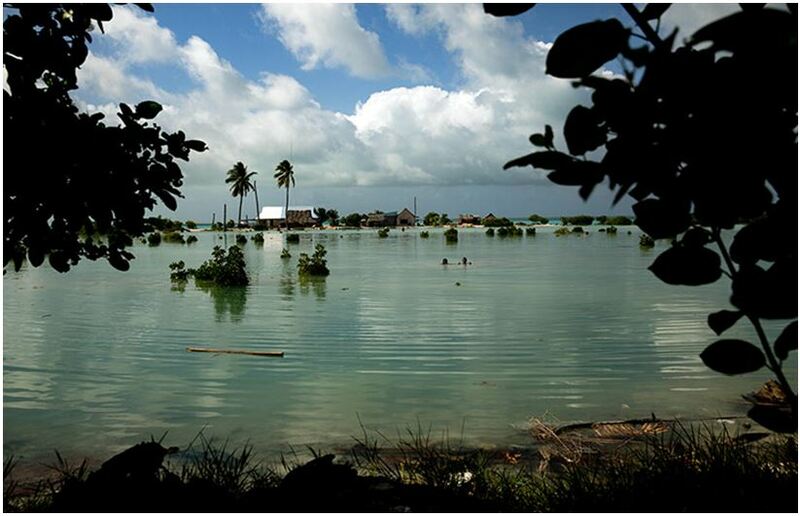 Kiribati has more than 100,000 citizens and its main island, Tarawa, suffers from severe overcrowding. The Maldives is an Island nation (1,190 islands in 20 atolls) in the Indian Ocean. Largely, the Maldives have been an independent nation throughout its history, with short periods of intervention by Portugal, Netherlands and UK from which it became independent in 1965, forming a constitutional republic. 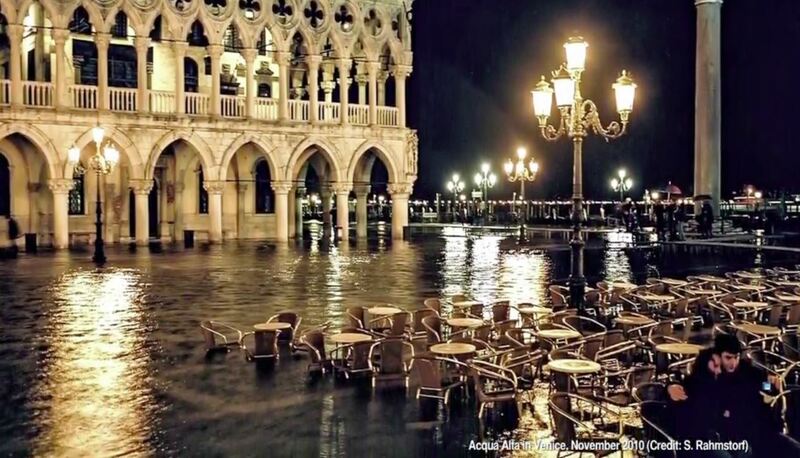 Already vulnerable to flooding due to storm surges and earthquake, rising sea levels associated with global warming are making human habitation here more precarious. This part of South Asia is close to the equator, where sea level rise is greater than in polar ocean, and the Maldives confronting the biggest increases of between 0.100 – 0.115 metres, according to a World Bank scientific report on 19 June 2013. Expected pertubations in the monsoon system combined with elevated peak temperatures put water and food resources at severe risk. An extremely wet monsoon, currently has a chance of occurring once in 100 years, is estimated to occur every 10 years by 2100. 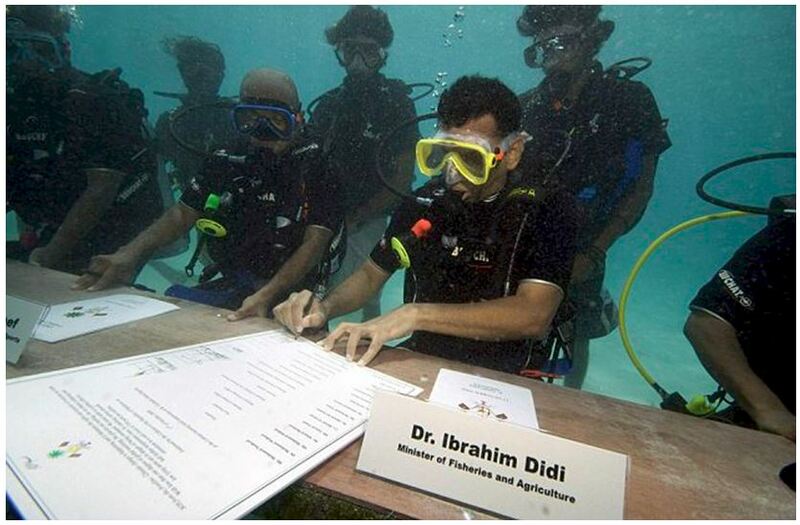 Former President Mohamed Nasheed holding the world’s first underwater council of ministers in 2009. The 30-minute cabinet meeting held six metres below sea-level was intended to show what the future could hold for the Maldives. 199 islands are inhabited with a population of slightly over 300,000 people. The highest point of land is 2 metres. 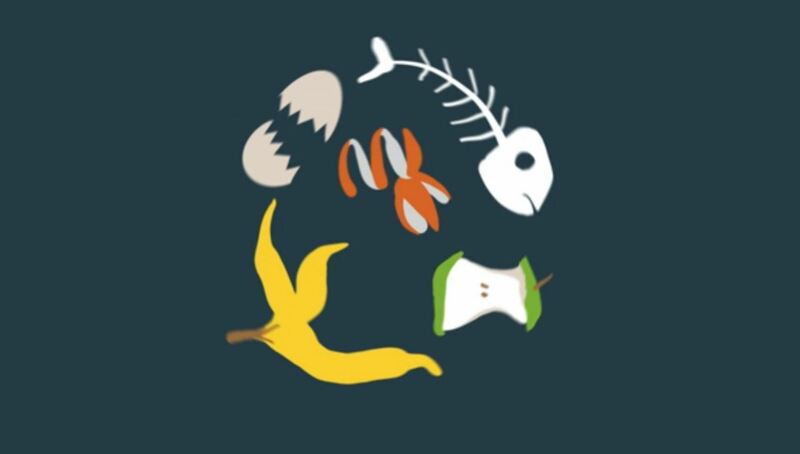 The reefs host over 1,900 species of fish, 187 coral species, and 350 crustaceans. Rising sea temperatures threaten coral reefs and cause bleaching and death. Worst damage is in the areas that are compromised by pollutants, and damaged by physical agitation. Vulnerability to Climate Change threats is exacerbated by damage to coral reefs which diminishes their protective function, a negative cycle of impact. The Marshall Islands is an Island nation forming part of Micronesia in the Pacific Ocean, with 34 low-lying coral atolls and 1,156 individual islands. Being variously conquered, occupied and governed by Spain, Germany, Japan and USA, the nation gained independence in 1979, forming a democratic republic. $759 million was paid to the Marshallese Islanders in compensation for their exposure to U.S. nuclear testing, and in 1952 with the test of the first U.S. hydrogen bomb, the island of Elugelab in the Enewetak atoll was destroyed. Party to the ‘Compact of Free Association’ with the United States, gives the USA sole responsibility for defense of the Islands. It also permits Islanders to live and work in the United States. 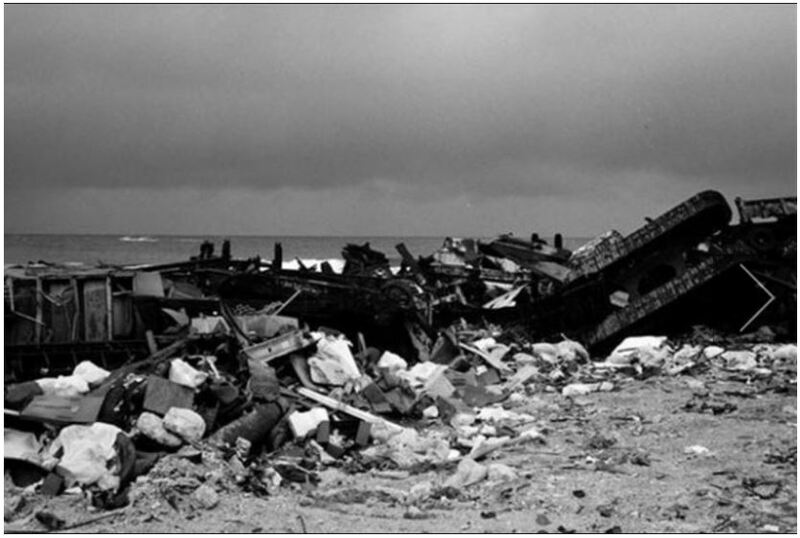 ‘Along the coastline of Majuro, Marshall Islands, old cars and trash are being piled up in an attempt to make seawalls and stop the rising water levels. In most places in Majuro there is no more than 50 – 100 meters in width between the Pacific and the Lagoon.’ – Greenpeace. 2008: Extreme waves and high tides caused widespread flooding in the capital city of Majuro and other urban centres. (1 metre above sea level), prompting the government declared a state of emergency. 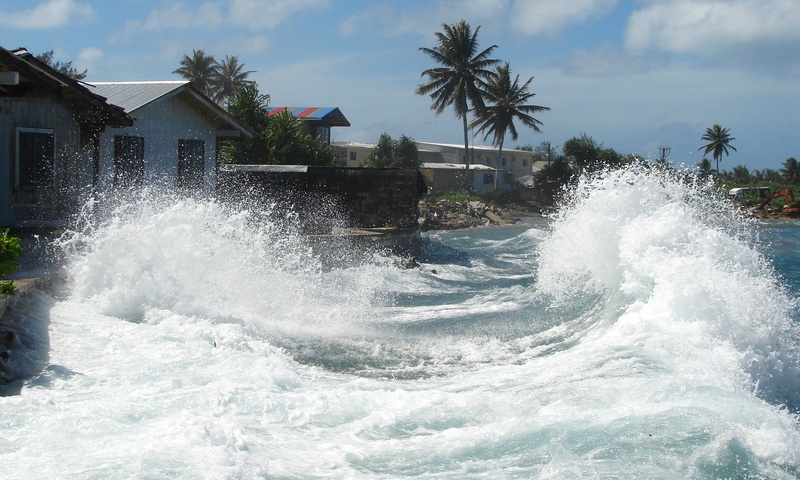 2013: Heavy waves breached the city walls of Majuro, while drought afflicted northern atolls of the Marshall Islands. 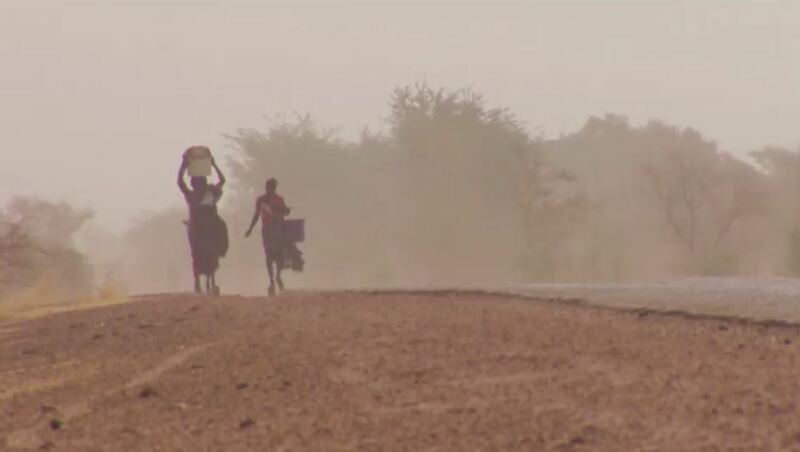 Drought affected 6,000 Islanders, surviving on less than one litre of water per day. Compounded by crops failures and food shortages, the impact on health was significant with the spread of drought-related diseases such as diarrhoea, pink eye and influenza. Tuvalu is an Island nation in the Pacific Ocean (3 reef islands and 6 atolls). Initially colonized by Polynesians, the Islands (as part of the Ellice Island group) became a British protectorate in 1892. Tuvalu became independent in 1974, forming a parliamentary democracy, but remains part of the Commonwealth. With a very low average elevation, Tuvalu is under threat from sea level rise. On top of this, these Islands (together with other islands in the region) are subject to annual king tide events which occur at the end of the summer. These raise the sea level higher than a normal high tide. King tide events cause flooding over low lying areas. Even worse flooding is experienced during ‘La Niña’ years when local storms and high waves are particularly prevalent. Estimates of future, sea level rise, which may threaten to submerge the nation entirely, are of the order 0.20 –0.40 metres by 2100. In this probable scenario, Tuvalu will become uninhabitable. A typical high tide reaches about 2.5 metres, a King Tide can be more than 3 metres. A small rise (0.5 metres) will see parts of the islands disappear. Islands are founded on coral which is porous and so saving these islands would be very expensive. With a population of just 11,000 people, will the outside agencies think it is economically feasible? 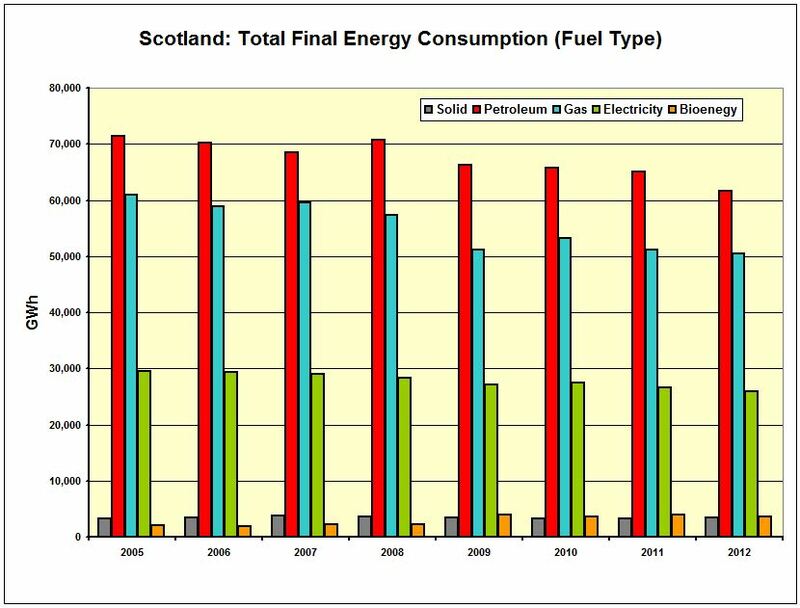 In Scotland, the devolved government launched ‘Scotland’s Zero Waste Plan’ in 2010. Prior to this, recycling rates were steadily increasing in step with environmental awareness amongst the populous of 5.3 million. This plan forms part of the suite of publications which supports the climate change legislation, Climate Change Delivery Plan (2009) and the Climate Change (Scotland) Act 2009. These policies are aligned within the European Union ‘Waste Framework Directive’. The main targets of the plan are for 70% recycling of all waste and a 5% landfill limit by 2025. It aims to achieve this by adopting the hierarchical; waste prevention, reuse, recycling and recovery, approach. The presentation document also highlights the need for landfill bans for specific wastes, improved source segregation and separate collection of waste and restrictions on inputs to energy from waste. The plan includes the instigation of regulatory reporting of resource use by all businesses, to give a clearer picture of current waste levels and future improvements. 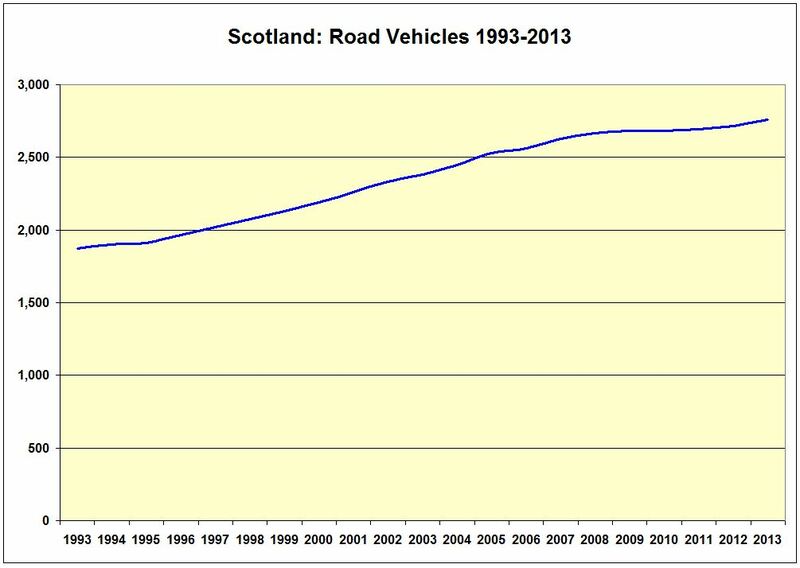 In 2008, Scotland produced almost 20 million tonnes of waste. 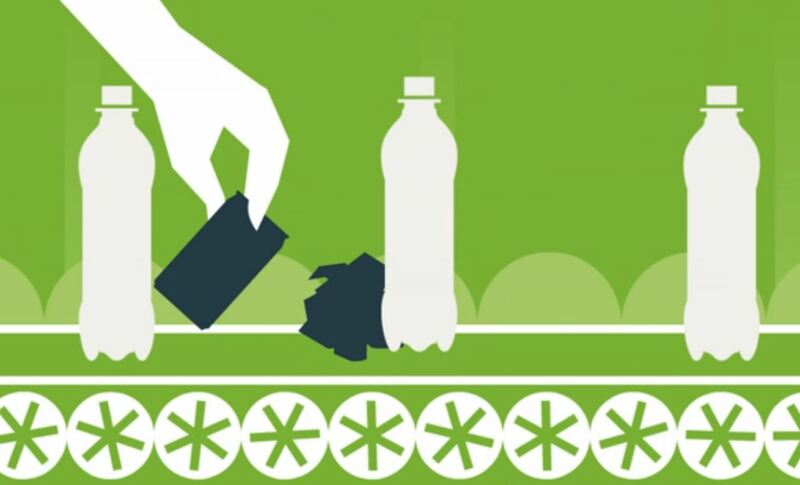 Recognition of the national mindset change required towards viewing waste product as a potential resource, as well as encouraging local authorities to take a lead role in this transformation by providing clear information regarding good waste management habits and collection practices, lie at the heart of the plan. 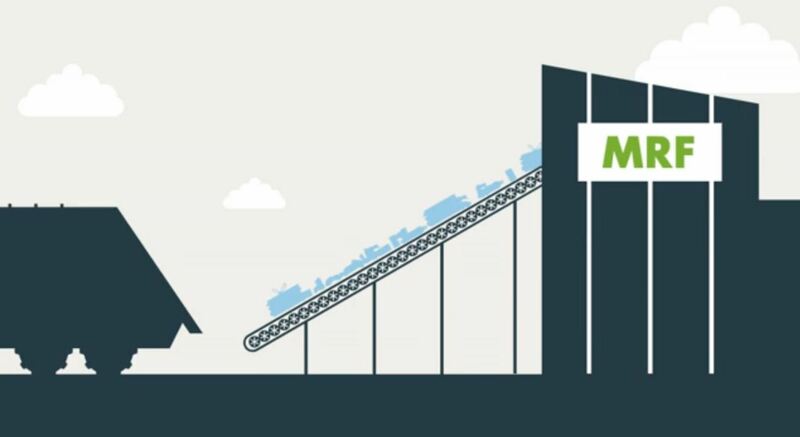 The Scottish government sees waste as an economic opportunity rather than a problem. It’s strategy is to develop sustainable, high value markets for recycled waste, and it aims to provide support in the development of infrastructure to this end. 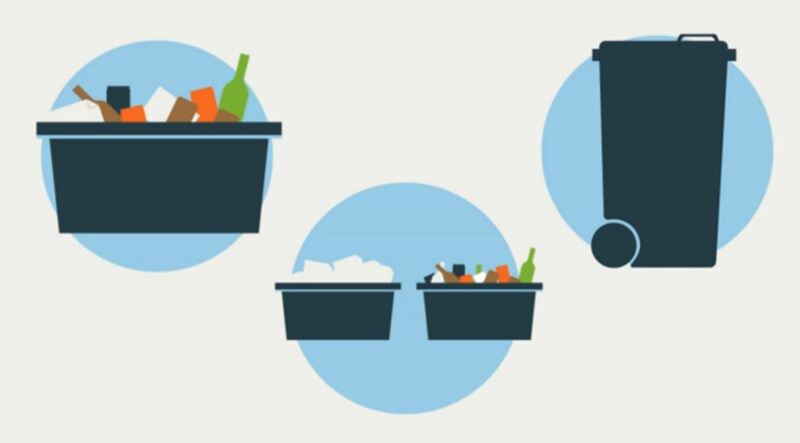 Together with SEPA (Scottish Environmental Protection Agency), and the local authorities, the government aims to raise awareness of the need for local and personal responsibility in waste management, through education. Community buy-in is seen as crucial to the success of this initiative. It is the responsibility of the 32 local authorities (councils) in Scotland to collect and ‘dispose of’ waste in their area. In my area, there is an alternating weekly collection of waste put into colour coded 240 litre ‘wheely bins’, one week green/black general non-recycled waste, the next week blue recycle waste. 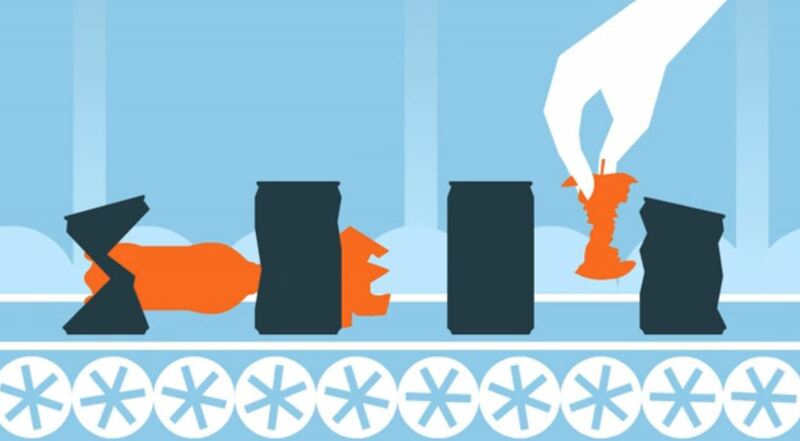 The recycle bin is only for plastic bottles, paper and card, and tins and cans. 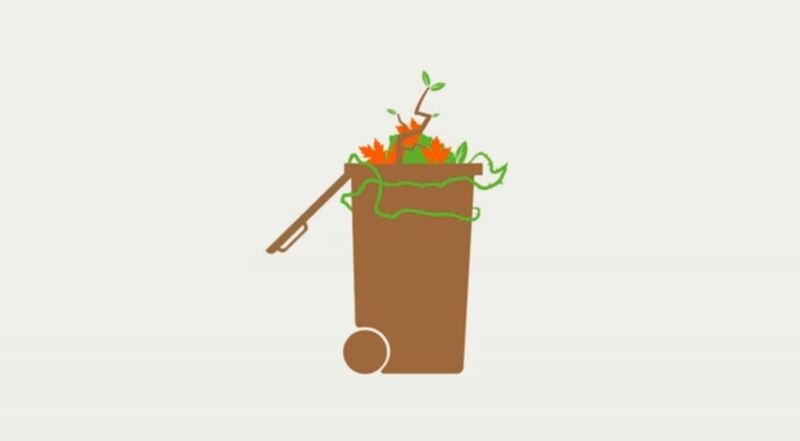 Urban areas also benefit from a garden waste collection in brown bins, which accepts grass cuttings, hedge trimmings etc. This suggests that there are no significant quality issues arising from using recycled glass as a feedstock. In a review of British Glass literature on recycling I found no reference to quality concerns. My local council state that other plastic containers and bags are not accepted due to possible contamination by contents and the difficulty in identifying and sorting the various types of plastic, and due to the lack of reliable markets for this type of recyclate. This is a barrier to higher recycling rates. However, the council promises that as new markets emerge, more materials will be accepted for recycling. So the solution is to develop these markets. 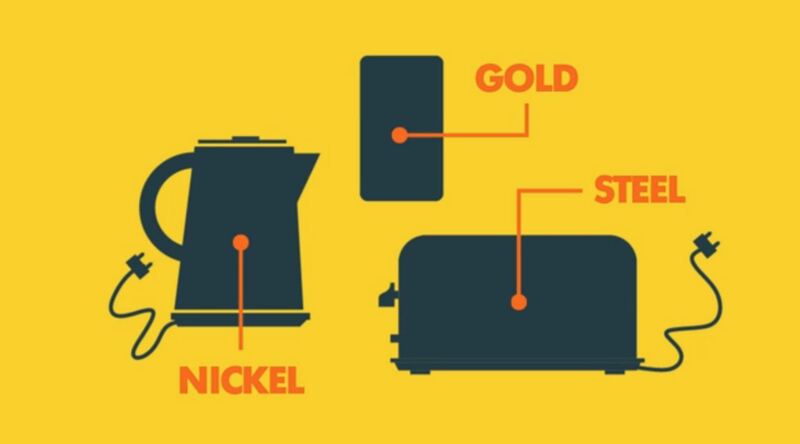 Throughout Scotland’s communities there are recycling banks for recycling different types of glass; clear, green and brown. There are usually collection bins for old clothing. Other facilities allow for collection of batteries (car & household), fluorescent light tubes, fridges & freezers and other electrical equipment. Organisations such as the ‘Freecycle’ network help facilitate reuse with an online itinerary of unwanted items, and a means of communication to arrange uplift by those in need. There are also many local charity shops which take unwanted items and sell them on for a donation. These mainly deal in furniture, clothing and books. There is also a local bookstore which deals in second-hand as well as new books. 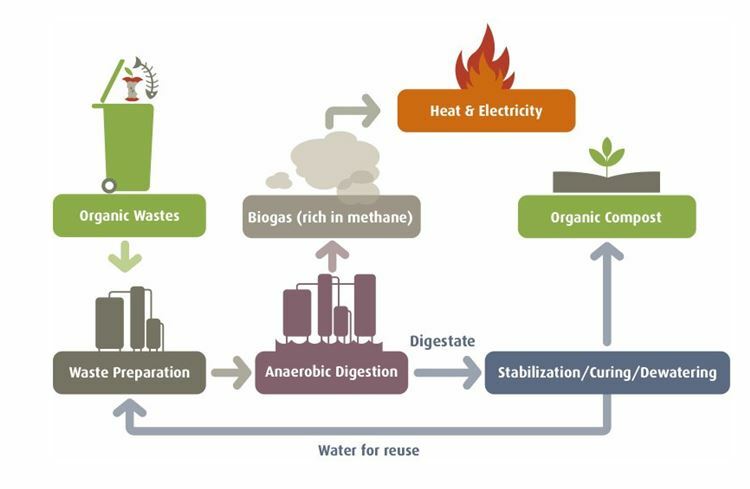 Linking the current recycling topic with our interests in energy, anaerobic digestion is a technology which spans both areas and is gaining in recognition as an economic means of converting organic waste product, food and garden waste, into energy with useful by-products. It enlists micro-organisms to degrade organic material, to produce bio-gas, a mixture of methane and carbon dioxide, which can be used directly as a fuel or refined to the quality of natural gas. The residue from digestion can be used as a fertiliser or soil conditioner. It is regarded as a renewable energy source and helps reduce emissions of greenhouse gasses by; replacing fossil fuels, reducing energy usage in waste treatment, reducing methane emissions in landfill, and replacing industrial fertilisers.